Nothing beats the comfort, taste and smell of fresh-baked bread. Unfortunately, making bread can be labor intensive and frustrating, especially if the end results don’t meet your expectations. That may be why many people leave bread making to the professionals. If you’ve been disappointed by bread baking in the past or if you’ve been too intimidated to even try baking bread at home, keep reading. Baking mouth-watering loaves is not as difficult as you may think. 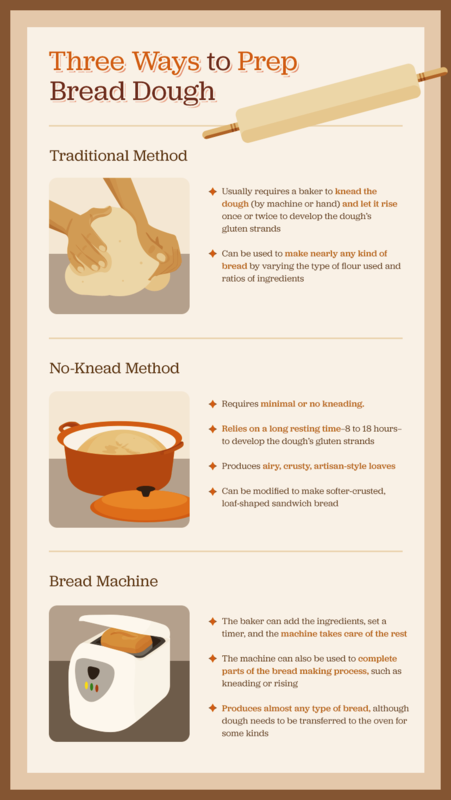 Baking bread at home has undergone a revolution in the past 40 years. Today, you can prepare bread dough as it’s been done for centuries or you can use a bread machine or no-knead method, both of which can make the process nearly effortless. Read on to discover which method best suits your lifestyle, schedule, tastes, and the season. We’ll give you a basic recipe for each method and some tricks and tools to help you bake delicious loaves every time. No one would call the traditional steps for transforming flour, water, yeast, and salt into bread simple. Countless books and websites give in-depth information on the subject. However, it’s a satisfying, versatile process to learn. Start with this simple, delicious sandwich bread (adapted from The America’s Test Kitchen Family Cookbook).1 Then, you can move on to more complex recipes that use a starter and whole grains. 1. Mix together the milk, water, honey, and 3 Tbsp. of butter in a large measuring cup. 2. Mix the yeast, salt, and 3 1/2 cups of the flour in a large mixing bowl. If using a standing mixer, use that bowl. 3. Mix the milk mixture into the flour mixture. 4. Knead the bread, either by hand or with a standing mixer, for about 10 minutes. 5. If using a standing mixer, remove the dough and knead by hand for one minute. 6. Form the dough into a smooth, round ball. 7. Place the ball in an oiled bowl and wrap the bowl tightly with plastic wrap. 8. Let dough rise in a warm place for 1 to 1 1/2 hours until it has doubled in size. 9. Place the dough on a floured work surface and press out the air. 10. Shape the dough into a loaf by forming it into a 9-inch square, rolling it into a cylinder, and pinching the seam closed. 11. Place the loaf seam down in a 9-inch loaf pan, wrap the pan tightly, and let it rise in a warm spot for 1 to 1 1/2 hours until it has doubled in size. 13. Brush the loaf with the remaining melted butter. 14. Fill an empty loaf pan about halfway full with boiling water. 15. Put the loaf pans side by side in the oven. 16. Bake for 40 to 50 minutes. The center of the bread should be 200 degrees when it’s done. 1. Stir together flour, salt, and yeast in a medium bowl. 2. Add water and mix for 30 seconds until the dough is wet and sticky. Add an additional tablespoon or two of water if the dough is not sticky to the touch. 3. Cover the bowl with plastic wrap and leave it at room temperature (ideally 72 degrees) out of direct sunlight for 12 to 18 hours until the surface is dotted with bubbles and the dough has doubled in size. 4. Use a bench scraper or spatula to scrape the dough onto a floured piece of parchment paper. 5. With floured hands, shape the sticky dough into a round. 6. Put the dough (still on the parchment paper) in a bowl, cover the bowl with plastic wrap, and place it in a warm, draft-free spot for 1 to 2 hours until it nearly doubles again. 7. Half an hour before the dough is due to be done with its second rise, preheat the oven to 475 degrees and place a large lidded pot on the center rack. 8. When the dough is done rising, remove the preheated pot using potholders. 9. Place the dough and parchment paper into the pot. 10. Cover the pot and bake for 30 minutes. 11. Remove the lid and bake for 15 to 30 more minutes until the bread is browned but not burnt. 12. Use potholders and lift the bread in the parchment paper out of the pot. 13. Remove the parchment paper and place the bread on a cooling rack. For more fiber and nutrients, use whole-wheat flour instead of bread flour and let it rise longer. Chef Mireya Merritt recommends an initial rising time of 18 to 20 hours for 100 percent whole-wheat no-knead bread.4 Mix whole-wheat and bread flours to suit your tastes and experiment with different rise times. 1. Select the loaf size. 2. Add the ingredients according to the manufacturer’s directions. 3. Select the “basic white bread” cycle. Get Rid of the Hole Dislike the large tell-tale hole in the bottom of bread-machine loaves? 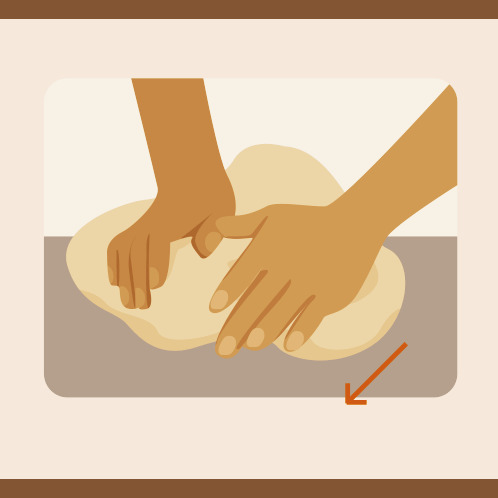 Before the baking cycle, take the dough out of the machine and remove the kneading paddle. Then return the dough to the machine and bake it. Let the Bread Machine and Oven Team Up If you like a crispy crust, let the bread machine do the dough prep, then move the dough to the oven for baking. Whether you hand knead dough or prefer a more modern method for preparation, you’ll be rewarded with the delectable taste and smell of home-baked bread. It’s not just the finished product that satisfies you. The entire process of transforming yeast, flour, salt, and water into bread can be therapeutic, creative, and calming. Once you’ve cut into a fresh-baked loaf, you probably won’t want to go back to the store-bought variety.